If you met my nonna you would never believe she is 88, almost 89. She is vibrant, stylish, and extremely energetic. She went back to Italy last month, but before she left we had a great time shopping together. In fact, we even bought the same scarf and handbag from TJ Maxx. I copied her since they were so fashionable and fun. I am my Nonna’s granddaughter. Like my nonna, you never know when I will break into song or try to teach someone something new. My cousin’s musician boyfriend recently recorded her singing and he is going to put all the songs together for us for Christmas. I can’t wait. When my nonna isn’t singing the songs of her childhood (many of which came from her days living through World War II), she is telling me how to cook. She knows I love cooking and entertaining and asks me all the time what I have cooked recently. Since I began this adventure 3 or 4 years ago she has been collecting recipes via magazine clippings and small cookbooks that she periodically gives to me from her purse. When she is in Italy, which is most of the year, I call her at least every Friday. Most of the time we talk about food. On this last trip I told my nonna I wanted a tutorial on how to make gnocchi. We didn’t have time to make the dish together so she explained it to me. I wanted to get it exactly right since I know gnocchi can be challenging, so I taped her with my iPhone. Here is my nonna sans makeup teaching me how! I followed all of her instructions, and after two fun tries and a few adjustments my gnocchi were really good! They are not great, but I have a feeling I just need patience and practice to get them jusssstttt right. PB and I, along with two of my cousins, are going to visit her this spring. I’m counting on a live hands on gnocchi tutorial complete with Nonna’s songs and homemade sauce. 1. Fill a pot with cold water. Sprinkle in some salt and add your potatoes whole and unpeeled*. Boil them until they are really soft, about 20-30 minutes. 2. 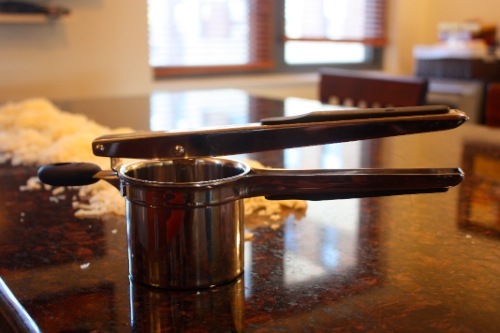 Peel the potatoes while hot and run them immediately through a potato ricer. ** Lay them out on your counter (I just rice them directly into small piles on the counter) and allow to cool at least 2 hours. 3. Bring them together and make a small well. *** Add your egg, olive oil, and salt and mix gently, adding flour as needed, until you form a dough. For me this was about 1 cup of flour. 4. Cut the dough into 6 or 8 long pieces. Sprinkle your counter with a bit of flour and roll out each piece into a rope. Cut each rope into 3/4 inch pieces. 5. 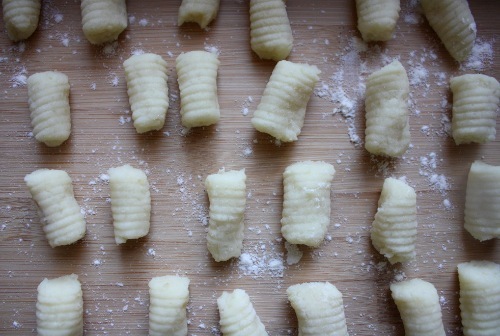 Take each piece of rope and either roll it off the back of a fork or on a gnocchi board. 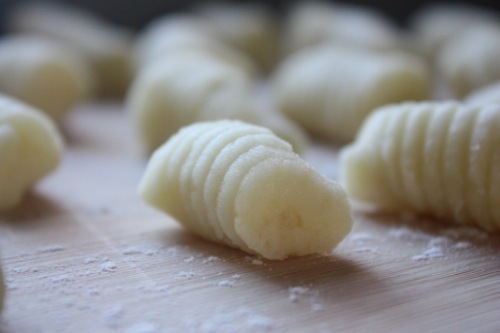 Don’t be afraid to use a little power- you want ridges in your gnocchi to better hold on to the sauce. 6. Heat water in a large pot. Add salt and 1 tbs olive oil. When it reaches a boil add your gnocchi in batches- about 10-15 gnocchi per batch. When they rise to the top of the pot they are done. Remove with a slotted spoon and place directly in sauce. Enjoy! *Note: Nonna says to boil the potatoes whole and unpeeled to keep as much moisture out of them. In the same regard, that is why she says to let them cool completely before mixing together. As much moisture as possible should leave them. **Note: This is what a potato ricer looks like. Nonna is becoming famous these days! Beautiful words about your nonna. And what a wonderful gnocchi recipe! I have been wanting to make traditional gnocchi for ages now…thank you for the tutorial and sweet post! Oh my gosh… I LOVE these videos!! These are absolutely precious and priceless. after tasting some amazing gnocchi in San Fran, I have been meaning to find a recipe. Great timing! These sound great and Nonna is wonderful! Love the video! I LOVE IT. LOVE LOVE LOVE LOVE. How awesome is Nonna! Like grandmother, like grandaughter! Loved this! I particularly loved the big finish…”and cheese!.” – Your nonna is so fabulous, enjoy her! This is precious! I love your relationship with your nonna. And thank you for sharing this recipe with us. Gosh.. I wish German sounded that lovely.. it does not! Does PB speak Italian too? My SO had to learn German since that’s what we speak primarily at home..thankfully he picked it up fast! @Rebecca – Thru Thin and Thick, He does not speak Italian. However, I am trying to learn Armenian since his family speaks it all the time! Absolutely adorable and priceless videos! I wish I had some like these of my Nonna making pizza for my family when I was little. I saw above that your Nonna speaks in dialect — may I ask where in Italy she’s from? I studied abroad in Italy last Fall and I am American-Italian so I knew some Italian before I went, as well as learned a ton when I was there. I ask because I pretty much understood every single thing your Nonna said, which I am proud of since I’ve been out of practice since I’ve been home 🙂 Although, your Nonna was using simple language and describing common ingredients and actions, but still! @Danielle, Well, she tries to speak proper Italian, but her dialect comes through a lot here and there- for example when she said “la ga la tavoletta” instead of “lei ha la tavoletta”… Anyway, she is from Trieste which is about 1 hour from Venice! Congrats on understanding it all- you are awesome!! Sei cosi fortunata d’avere una nonna italiana! It was great to hear you speaking Italian again – it’s so familiar. Reminds me of our crazy class in Firenze! 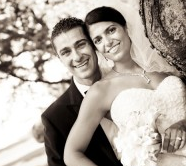 Thanks for giving us a peak into your Italian family. I look forward to hearing about your European travel adventures. @Christine @ CEM eats, My nonna would definitely say that was pazza! I can’t wait to go back to Italy this spring- it has been 7 years since our studying abroad days. Can you believe it?! This is a lovely post! What languages do you speak, Sabrina? Did you learn them just growing up in a multi-lingual home, or did you learn the languages by taking classes? @Laura, I speak Italian fluently. I have a basic understanding of Arabic and Spanish, and I am currently learning Armenian. I grew up with my mom and Nonna speaking Italian in the house, and my mom and dad speaking Arabic when they didn’t want me to know what was going on or at holidays with relatives. My Italian skills are so comprehensive because I also studied it in college. Before studying it I made many errors in my endings and especially with writing. These gnocchis look amazing! 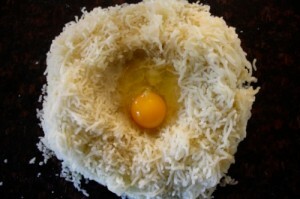 I need to get my Italian fiance to make me some pretty gnocchis like nonnas!! Such a great post! I love seeing how things are made authentically, and gnocci is no exception! You are fortunate to be able to have her to teach you these things! Great post… Gnocci is my favorite. I used to love them from Adesso off Thayer before they closed. Nonna’s seem even better. Love the video and Nonna. @Allie, Why must you taunt me by mentioning Adesso! They were my favorite too, especially the sauce. I am trying hard to mimic both the gnocchi and the sauce, but I can’t seem to get either quite right! Aww, she is so cute…I love this post!